In studies of environmental stresses caused by metals, Rhodococcus species are routinely identified as part of a beneficial microbial rhizosphere community. These bacterial strains, inhabiting diverse ecological niches, possess a variety of enzymatic activities to carry out relevant biodegradation reactions, such as degradation of organic pollutants in some cases using them for both carbon and energy. In this context, most Rhodococcus strains have been found to have very high levels of metal resistance. Thus, these microorganisms are not only capable of metabolizing various organic pollutants in the presence of co-contaminating heavy metals, but they can also bioadsorb and/or bioconvert various metals and metalloids [metal(loid)s]. Indeed, some Rhodococcus exploit these metal(loid) compounds to generate biogenic nanoscale materials of intriguing physical-chemical properties, which can find applications in biotechnology. 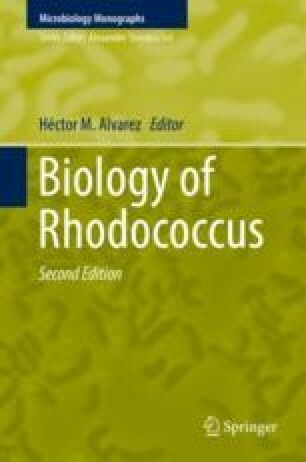 This book chapter has the focus in overviewing the biotechnological relevance of the Rhodococcus genus relationship with metal(loid)s, the bioprocesses elicited by these microorganisms in handling metal(loid)s’ toxicity, and the importance of these actinomycetes in the context of the bioremediation and bionanotechnology fields. Natural Science and Engineering Research Council of Canada (NSERC) is gratefully acknowledged for the support of this study (Grant/Award Number: 216887-2010).